Two minutes. That’s how long our 3M™ Window Films deter criminals from breaking and entering through a glass window or door. This is the added layer of security you didn’t know you needed. Protect your family or valuables from break-ins, vandalism, smash and grab crimes, and even bomb blasts. Don’t be a target for crime. Reinforce glass windows and doors to reduce your risk. 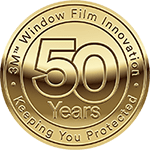 Carolina Solar Security’s 3M™ Window Films are ideal for storefronts, first-floor apartments, or residential entry points. The strong adhesive also protects against broken glass shards that could result in injury. You may never worry about a potential bomb threat until the day happens. However, these kinds of occurrences are on the rise, especially in schools and government offices. Accidental explosions in labs and plants are also an everyday threat. Reduce the chance for injury and protect your assets with 3M™ Window Films. Security shouldn’t wait until you need it most. Call Carolina Solar Security to schedule an onsite consultation, where we will assess your needs, make product recommendations, and provide an estimate.